You’ve noticed the trend of compact, boxy small truck/wagons on the freeways. And you’ve seen the ads with the party animal hamsters. 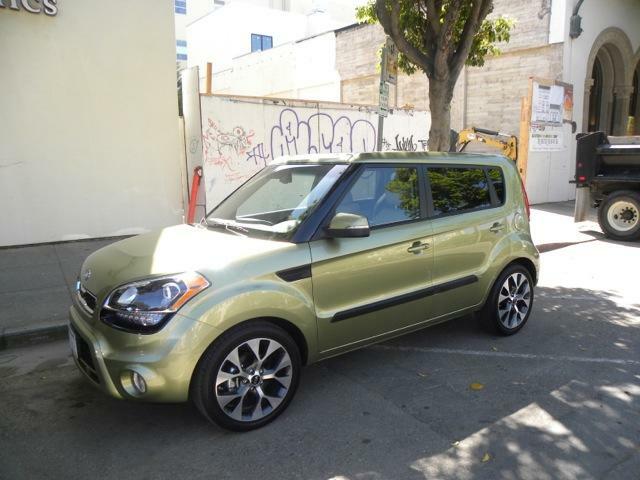 But what’s a Kia Soul really like to drive? 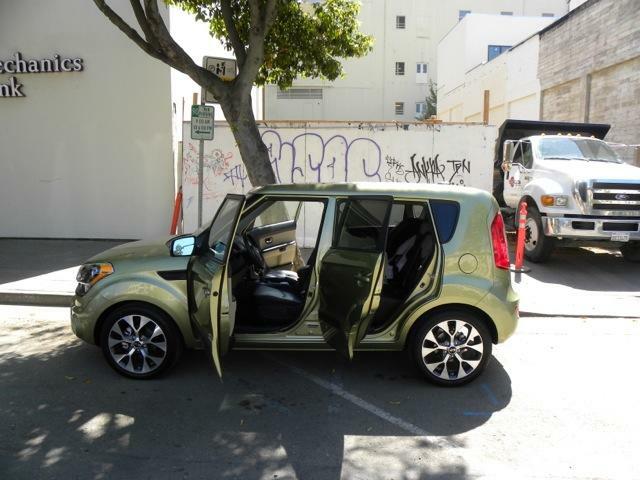 I started finding out earlier this week when two Kias drove up to my house and only one drove away, leaving me with a shiny new Alien Green 2012 Kia Soul ! to play with for a while. Yes, that last sentence included both the words “Alien Green” and an exclamation point – on purpose. 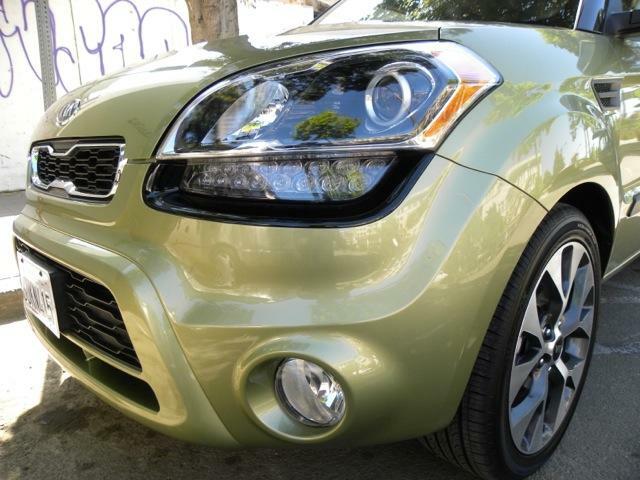 The ’12 Soul is available in eight factory paint jobs; my tester is finished in a metallic light green the Korean automaker officially calls “Alien.” Kia’s Urban Crossover Vehicle (their term) comes also in your choice of three trim levels: Soul (base), + (plus) and ! (exclaim). I got the top shelf Soul !, augmented further by some extra bits we’ll get to in a moment. If you’ve never seen a Kia Soul, just close your eyes and imagine what a circa 2012 urban crossover that’s available in a color called Alien and a trim lines denoted by punctuation marks might look like, and you’ll probably have a decent idea as to the car’s overall spirit, anyway. 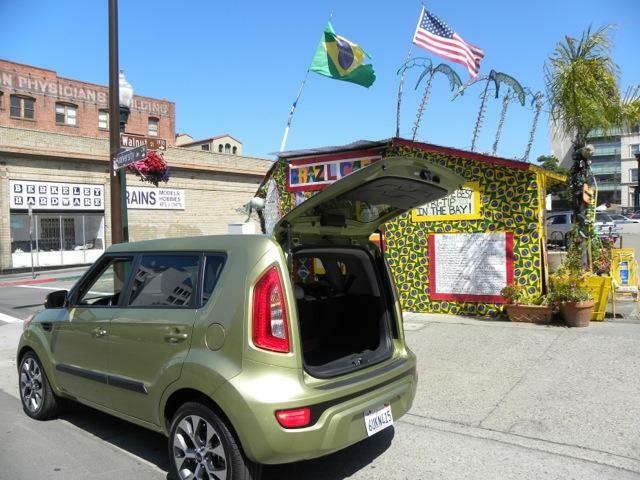 This is a people hauler with attitude, made for the would-be city dweller who’s as quirky as he is practical, and as as individual as he is environmentally conscious. Soul is a car with Soul, or at least it’s meant to be. 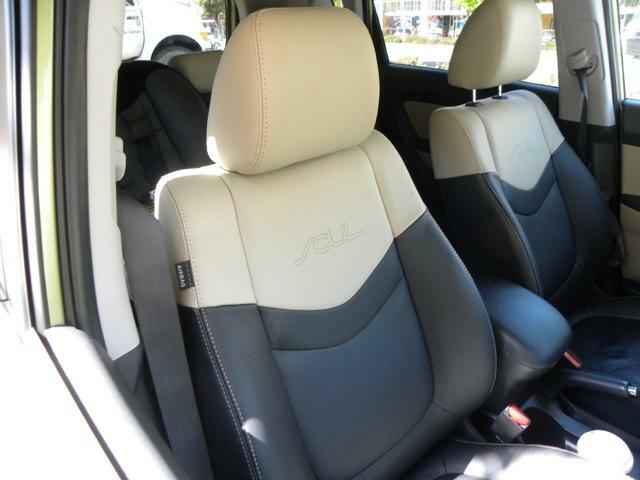 The 2012 Soul line starts with the $13,900 base model with a six speed manual transmission (add $1,800 for an automatic) and ranges through the Soul + at $16,300 ($17,300 for the automatic) to the $19,600 Soul !, which is available only with a six speed automatic. Soul’s base engine is a 1.6 liter inline four that puts out 138 hp @6,300 rpm and 123 lb-ft of torque @4,850 rpm. Stepping up to either the + or ! line upgrades what’s under the hood to a 2.0 liter i4 that yields 164 hp and 148 lb-ft. The base engine is rated by the EPA at 27 mpg city/35 highway, while the + and ! lose a mile at 26/34. All cars pack 12.7 gallon fuel tanks to fill with standard unleaded gasoline, and claim a curb weight of 2,778 lbs. Soul is a five-seat crossover/wagon with four doors and a rear lift gate. Behind the rear bench seat is a small cargo area with hidden storage compartment and organizer tray beneath the floor mat. Kia lists cargo volume as 19.3 cubic feet, 23.7 cu ft with the cargo tray removed, and 53.4 cu ft with the rear seat folded down. That’s a bit less than a Honda Fit but more than either a Nissan Cube or Scion xB, all of which are comparable in price, power, weight and size to the Soul. All Souls include goodies like Bluetooth integration with steering wheel audio and phone controls, USB and Aux jacks for the CD/MP3/SiriusXM stereo, a 12V power outlet, power locks and windows, tilt/telescopic steering column, remote keyless entry, a 60/40 split folding rear seat with three headrests, and front, side and side curtain airbags. That’s a nice haul of accessories and features for a $14,000 car – while you’d think every new car in 2012 would come with tech-focused amenities like audio aux jacks and Bluetooth integration, they don’t. So it’s great to see Kia appealing to young, smartphone toting buyers with gadget-friendly features alongside folding seats and good fuel economy. Stepping up to the + line adds, amongst other things, 16-inch alloy wheels, upgraded speakers, dual 12V power outlets, and leather wraps on the steering wheel and gear shift knob. Top line Soul ! vehicles also get stuff like 18-inch alloys, a power sunroof, LED “positioning lights” (running lights), and an Infinity audio system with more power, a subwoofer and center speaker, and multi-color speaker lights that can be set to flash in time to whatever’s playing on the sound system. My loaner went an extra step with the $2,500 Premium Package, adding navigation, rear view camera, push button start, heated seats covered in leather, and automatic climate controls. While the car didn’t have every option box ticked off – where’s the rear spoiler ($295) and interior lighting kit ($395)? – it did come with the cargo net and rear bumper appliqué, each of which added fifty bucks to the sticker. The bottom line for my Alien Soul ! was $22,,950 including destination charges. 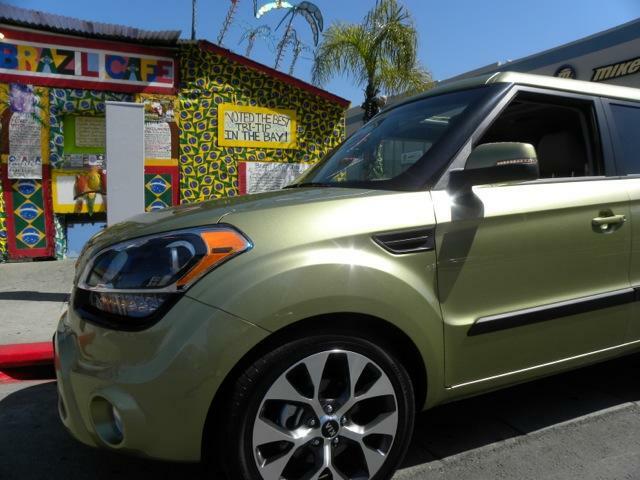 All 2012 Soul models are covered by Kia’s 10 year / 100,000 limited powertrain warranty and 5 year / 60,000 basic powertrain warranty. The car also comes with a 5 year / 60,000 roadside assistance plan as part of the sticker price. Soul struck me as handsomer in person than I remembered it from those hamster-infested ads I’d seen on TV. Boxy though it is, the car’s distinctive grille, vertical tail lights, and rear-sloping roofline give it some flair that I personally prefer over the ultra-square look of the xB and Cube. While I’d never choose the Alien paint job for my own, it works well with the car’s black accents and chrome-on-black wheels. There’s something of a playful ruggedness to the look which somehow avoids being goofy and faux-tough, and instead comes off as playful and fun. After a quick orientation from the Kia PR rep, I grabbed my license, plugged my iPhone into the stereo by way of the clever iPod to USB/3.5mm hybrid cable included in the car, and took my Alien Soul ! for a spin. The last thing the PR guy said to me was, “Put ‘er into manual shift mode and you can have some fun.” So I did, and I did! Cruising around for about 45 minutes on hilly neighborhood streets and chunks of two freeways, with a quick urban pit stop, it was immediately clear that Soul is a fun little five seater with plenty of pep for everyday driving – at least in its top line, two-liter configuration. Never having driven a Soul with the base engine, I can’t compare, but the upper end model had plenty of juice to inspire confidence merging into freeway traffic, cruising along with it, and getting out in front of it with bursts of 65-80 mph acceleration. I might have gone a little faster than that, too … let’s just say the PR rep made me promise I wouldn’t break 100. He was right, though – manual shift mode added some fun to the proceedings, letting me push the four potter up closer to its 6,800 rpm redline with smooth electronic upshifts. Soul proved itself a nimble little car during our short first date. It seemed equally comfortable cruising at 75mph as it was coasting down a curvy, hilly road and parallel parking on a busy city street. The ride was surprisingly smooth and quiet on the freeway, so long as I didn’t push it too hard. When I crept above 75 or so on the speedo, the car started to bob and weave a little as it sped atop the neglected freeways of Oakland, CA, and I felt a wee bit twitchy following the bends of the interstate at faster speeds. Likely the 18-inch alloys contributed to the harsh ride at higher speeds; such is the price of looking good. Then again, when I stayed within non-attention getting speeds, things were pretty nice. 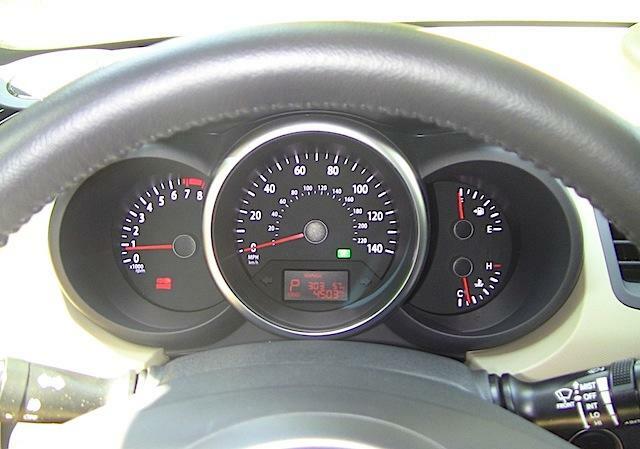 The car also offers an Eco mode which can be enabled and defeated via a dashboard-mounted button. Turning Eco on reduced throttle response ever so slightly, so I turned it off. I mean, c’mon, this was my first drive in the car! I assume Eco helps with fuel economy, so I’ll mess around with it more later this week. Upon first sit, so to speak, the driver’s seat was quite firm and comfortable, though I wish it offered power adjustments along with the internal heaters I haven’t yet tried. To be fair, not many cars in the $20k range offer power seats, but a guy can dream, right? The A/C blew cold and offered auto temperature based control, and the power sunroof reaffirmed my belief that all cars should come with sunroofs. Gauges were easy to read, the leather wrapped steering wheel and shift knob felt luxe beyond the car’s price tag, and the power mirrors were easy to adjust. Visibility through the boxy little rear window isn’t the best, but it’s passable, and while I haven’t messed with the nav system yet, the rear camera that displays on the touchscreen made parallel parking a breeze. 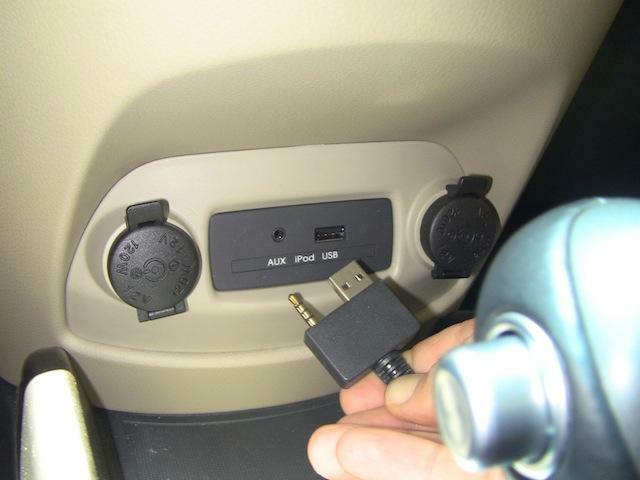 Last but not least, I haven’t yet paired my phone with the car’s integrated Bluetooth system, but I did have a few issues connecting it to play music through the 350 watt Infinity stereo. 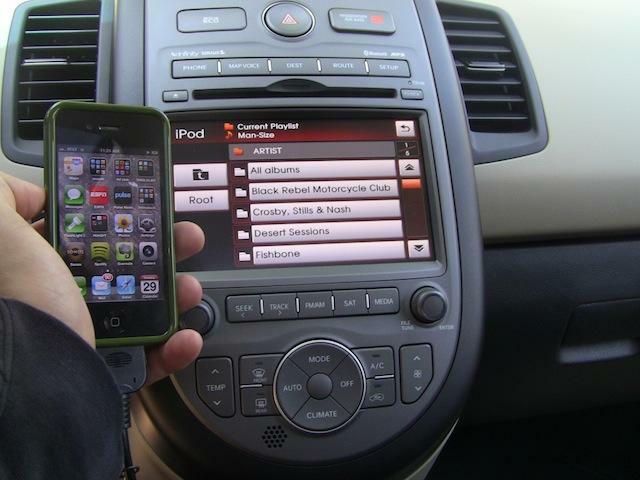 I’d plug my iPhone 4 in, the system would read my music library and let me navigate it via touchscreen and steering wheel controls, and then call things to a halt with a “Reconnect iPod” error a minute or two later. So I’d try again and get the same results. After this happened three times I gave up and switched over to SiriusXM radio, which worked fine. Then I tried the iPhone again for the last leg of my little outing, and it worked without complaint. So let’s chalk it up to user error for now. Honestly, though, I wasn’t all that impressed with the super premium sound system, even after fiddling with the three-band tone controls. The infinity didn’t sound bad, but it didn’t sound all that premium to me – it can get louder than the subwoofer-less factory system in my ’09 Prius, but I’m not quite sure it actually sounds any better. That said, I’ll fiddle with the settings awhile – and load up some Black Sheep – before I take my Alien Soul out again. I’ll be reporting back on the Soul later this week. So if you’ve got questions about it, hit me up in the comments!